When considering buying a new spa on the Gold Coast, shopping around is an imperative part of the process. At Aqua Pulse Spas we recommend you take time to look at the options available to you, because we know our portable spas are second to none, in both quality of manufacture and features. Our customer service is highly regarded because with decades of experience, we know spas. We design our own portable spas down to every detail, taking into consideration comfort, space and variable therapy options to suit all users. Our family range are the best way to spend weekends and the holidays with friends and family with room for everyone. 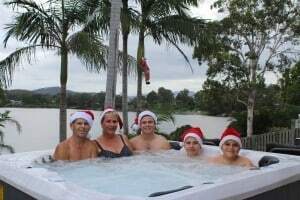 The Horton Family from the Gold Coast are still enjoying their spa almost every day, and say it’s the best way to end a long day, we definitely agree, so call us today (07) 3208 4625 and talk to our experienced team about the best option for your lifestyle and requirements. We have joined forces with reliable delivery companies all over Australia to make sure wherever you are, you can enjoy resort style living at home with a spa from Aqua Pulse Spas. See below photos of the Horton family’s spa and review. “Thank you Aqua pulse spas for the great service you gave us. We are so happy with the spa , would definitely recommend you to others.” The Horton Family from the Gold Coast.